Love the profiles of each climber against the stunning sky and mountainous backdrop. Wonderful shot. The shadows of the climbers on the sky is beautiful. Wow. This takes my breath away! I really love your photos. Looking forward to coming back often. Some fairly suspect ropework going on there! Great images – but the font in the lower right hand is hard to read. More function -less form, please. Very good point of shot. I like your travel photo, its great! Greeting from Ukraine! 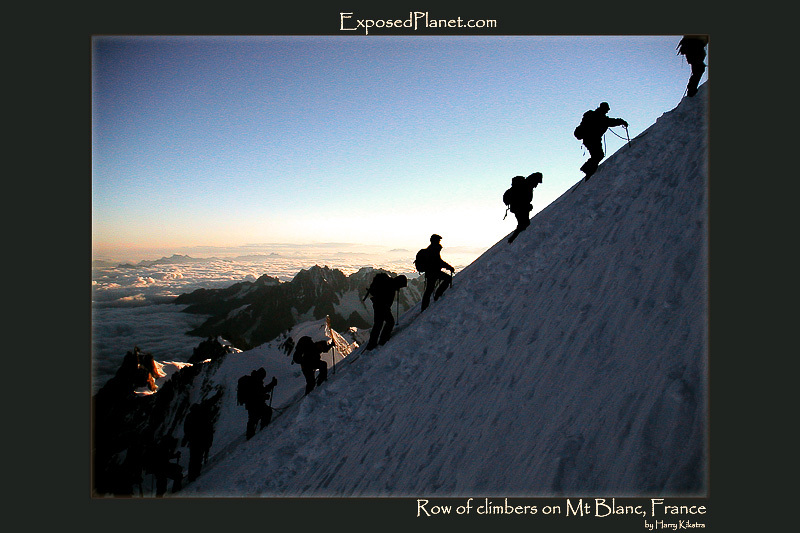 The story behind "Row of climbers on Mt Blanc, France"
Mt Blanc is the highest mountain of the Alps and Western Europe, and therefore already a magnet to climbers and tourists alike. It is not too difficult to climb, but still often underestimated and many wannabe summiteers turn back due to altitude sickness, fear of heights, unable to accept that the weather might have different plans or even due to complete exhaustion. Taken with my first digital camera, at that time really cool as it had a full whopping 2 megapixels and 3 times optical zoom!